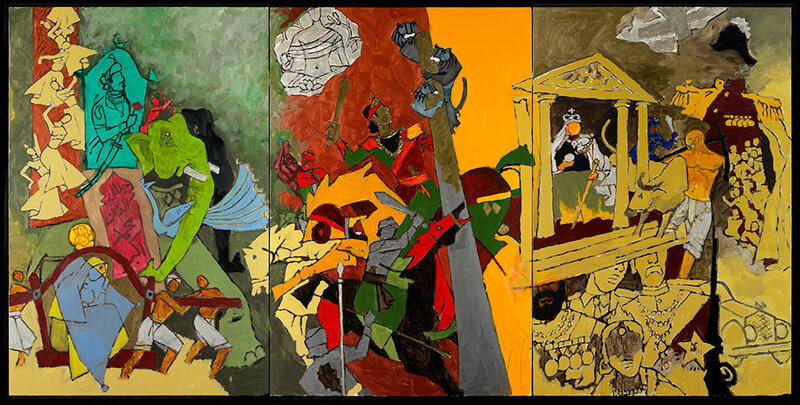 “Three Dynasties” by Indian painter MF Husain, depicting three empires that ruled South Asia: the Mughals, the Mauryas, and the British. If you’ve been watching the news recently, you may be aware that tensions between India and Pakistan are at an all-time high, following a terrorist attack on Indian military forces in Kashmir, Indian strikes in Pakistan’s Khyber Pakhtunkhwa province, and Pakistan’s capture of an Indian pilot. I’m not here to offer any political analysis, but something I have noticed on Twitter and other social media is jingoistic, hypermasculine nationalism, calling for strong military responses on both sides.